"The camera stays on me!!!" Maybe I have been living under a rock for the past few years, but I never even knew there was a enough of a groundswell of support for the original Turbulance to warrant the release of a Turbulance 3. For those wondering how we got from the box office disappointment Turbulance to Turbulance 3: Heavy Metal in the span of five short years, you are not alone. Anyone baffled at just how sequels to what can best be described as cinematic garbage get made, look no further that the fact that Hollywood has lost its mind. 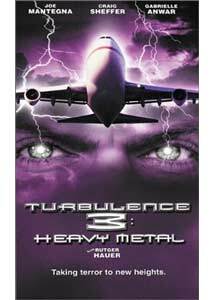 As has been the case with each of the films in the Turbulance trilogy, Turbulance 3 focuses on ordinary people forced to fly a jetliner and stop certain doom from occuring. This time around it is Slade Craven (Mann) a musical super star whose last concert is going to be something special. From the belly of a 747 he intends a farewell concert seen via a pay-per-view web broadcast. All hell breaks loose when a crazed fan takes over the aircraft and plans on crashing it in Kansas as part of a final act of a Satanic cult. On the ground, the FBI try to bring the plane down while a young agent (Anwar) and hacker (Scheffer) start to develop a friendship. From its poor production values to even lesser acting abilities, Turbulance 3 doesn't feel as much like a movie as it does a lesson in how NOT TO make a movie. It seems as though The Movie Clich� Checklist was utilized throughout the picture. Not one moment feels original. It is not surprising that common sense has been thrown out the window in Turbulance 3, yet it is alarming just how idiotic the script can be at times. Looking for proof? How about the scenes in which a notorious computer hacker is so friendly that he allows the FBI agent sent to arrest him to sit down next to him and chat as they try to save the plane. Or how the leader of the FBI Computer Crimes division taking the lead of the investigation single-handedly. It doesn't get more preposterous than this, my friends. While the cast of Turbulance 3 is not likely to garner any sort of award nominations outside of Razzies, those involved in the film have done fine work before and could have here if only the script weren't so sub par. Gabrielle Anwar (Scent Of a woman), Craig Sheffer (The Program), Rutger Hauer, and Joe Mategna all fall on the flat dialogue of the script. Most surprising is the appearance of Hauer who has all of five lines and serves no use in the plot. I suppose the producers needed a familiar face to draw audience. Reviewer's Note: As I sat down to watch Turbulance 3 my heart was filled with a heavy sadness due to the tragic events of September 11th. As noted above the film deals with a hijacked jetliner intended to be used for certain terror. While only a movie, it is hard to view Turbulance 3 and not be reminded of the horrific events that transpired in New York, Pennsylvania and Washington. I, as well as everyone else at digitallyOBSESSED.com, feel great sadness for the families affected by these events, and others whose lives will continue to change long after this day, which will live in infamy. Too often we watch movies and read novels hoping to god that the events that transpire within will never become a reality. In some ways they have, and because of it we may never be the same. Image Transfer Review: Trimark presents Turbulance 3 in a 1.85:1 widescreen transfer. Detail and sharpness are each well done, with little edge enhancement. Colors for the most part are fine with little bleeding, and black levels show strong grain on more than one occasion. Overall this is a decent transfer with only a few flaws to lower the grade. Audio Transfer Review: A 5.1 Dolby Digital track is offered, although anyone expecting an active mix will be disappointed. Dialogue is well done with little harshness and few dropouts. The surrounds come alive with the Craven's rock music as well as the jet flying overhead. Extras Review: A commentary track by Producer Ogden Gavanski, Screenwriter Wade Ferley, and actor John Mann is the only extra feature. As opposed to the more logical choice of repeating "I'm Sorry" over and over again the three shower praise on the film and the actors. It is a light hearted track, although the love of the picture by the three grows tiresome. Turbulance 3 goes beyond being a bad film. It is rare that a picture can make me long for the presence of both Ray Liotta and Lauren Holly (the stars of the original), yet this movie does just that.